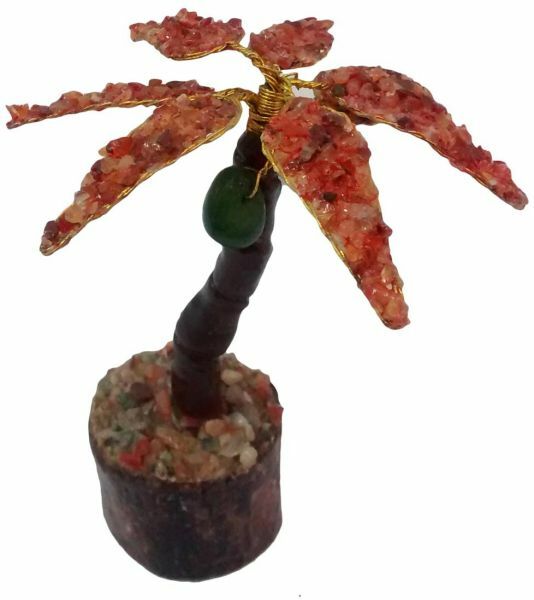 A beautiful home decoration piece of semi precious agate stone in a coconut tree shape. It has leaves of red Agate stone.The stones are uniquely placed in a leave shape frame. It has around 7 leaves, a wooden trunk and a natural wood base. This amazing handy craft is a beautiful home decore of 12 cm tall being a beautiful home decore it also gives benefit of agate stone. Agate enhances creativity and strengthens the intellect, making it a beneficial stone. Agate is a very protective stone. It has been given natural look with placing 2 Agate stones hanging which gives a natural beautiful tree look.